a heated argument in the office prompted this post. i do not like footway* parking for a number of reasons and it is another in a long list of symptoms of a wider car-centric society. walking is so dangerous and unpleasant! I would have said "debate" but it did develop into an argument (Oh, I'm sorry, just one moment, is this a five minute argument or the full half hour?). Now, I will declare that I am in the "haters" group for footway parking, but this may be because I do walk a bit and I find cars parked on "my" footway a constant irritation. I do not want to be fenced in by cars and vans on one side and fences and walls on the other. I have also regularly witnessed cars bouncing up the footway outside our local primary school where my and other kids are walking along and I wonder if I should be lobbying for a drive-thru classroom! So, it all started when a colleague lamented the random nature in which footway parking is agreed. He was annoyed that a lack of senior management or political leadership meant that decisions were being made on the basis of he who shouts loudest gets (local government at its best). Footway parking is an easy and cheap thing to install (in London at least) and so politicians love it as they are seen to be doing something. Now, there were three of us in the room and my other colleague felt that if the road was too narrow for parking (often on both sides), then footway parking was a sensible way of letting people park and maintaining emergency vehicle access. I gave my favourite example of a cul-de-sac which had footway parking on both sides. The remaining footway is just less than 1m. If people park within the marked bays, you can barely drive a car through, let alone a fire engine or a refuse vehicle. Here is a photo. The cars on both sides are parked out of bay which is parking-ticket land (in London at least), but being in the bays simply does not work as even cars will struggle to get past. So, after a bout of parking tickets, the residents went loopy and "something had to be done". I proposed taking away parking on one side as it was the only way to get fire and refuse vehicles into the street. The residents went loopy again and councillors demanded a site meeting which I duly attended. I invited the local fire brigade officer and he explained to the massed experts that he could not get a fire engine into the street and so his fire-fighters would have to run hoses along the street (over some distance), rather than get close to the hydrant at the end (they carry some water in the fire engine, but pump water from the mains if they are fighting for a while). The experts suggested the fire engine could drive over their gardens or bash the cars out of the way. The local fire officer said his engines were too heavy for the grass and the fibreglass cabs tended to smash in a collision; besides, with a house on fire, this was wasted minutes. Even when the pre-arranged (but not announced) fire engine turned up and could not get through, the residents decided their parking was more important than burning to death (my sarcasm). (1) The idiot(s) who "designed" and agreed the footway parking did not think it through in terms of space left for people to walk or fire/refuse access. Residents should have been told that finding parking was their problem from day one. I doubt the decision to proceed was taken formally, rather than a junior officer told to get it painted in. (2) The residents were so wedded to their cars, so intent on parking as close as possible, none of them were bothered about what would happen if their house was on fire. This was fine for the noisy people at the meeting, but I knew some were privately worried, just scared to speak out against the noisy lot. To this day, nothing has been resolved and there has not been a fire. Of course, finding parking is a daily issue for people; having their house on fire is not. The chances are, they will never be involved in a house fire. Was my idea of removing parking on one side therefore a gross over-reaction? I think that the rot set in many decades ago and no government has dared to act. In London, footway parking is kind of regulated following the provisions under S15 of the Greater London Council (General Powers) Act 1974. This piece of legislation effectively bans parking on footways and verges in Greater London unless otherwise permitted (using signs and/or road markings). Of course, this has created a limited hoop to jump through in order to introduce footway parking, but at least in theory some thought has to go into the process. Interestingly, Exeter had its own Act which does pretty much the same thing (S30), but this is rare. The GLC acted 40 years ago to try and stem the problem and will probably take another 40 years to sort out the mess in the rest of the country! and so the footways are the natural place to park for them. Elsewhere, footway parking is effectively "tolerated" and enforcement only tends to come into play when the police decide to act because the offending vehicle has caused an obstruction or if there is a Traffic Regulation Order (TRO) in place banning footway parking which would allow a council to enforce where parking has been decriminalised. In Scotland, there are attempts to sort the situation out, but this is yet to make it into law. S22Road Traffic Act 1988 - leaving vehicles in dangerous positions. S137Highways Act 1980 wilful obstruction of the free passage along a highway. S72 Highways Act 1835 - driving on any footpath or causeway by the side of any road made or set apart for the use or accommodation of foot passengers. Of course, this is criminal law and so the driver is being prosecuted and so might be considered a bit harsh and of course, will the police really bother with mounting a criminal case against somebody parked like a fool? You should read Carlton Reid's excellent post on footway parking which has lots of background to the legal issues with a funny video from "The Young Ones" which is one of my favourite asides from the show! 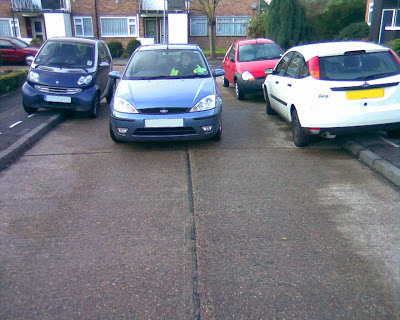 In February 2011, the Minster, Norman Baker MP, wrote to councils asking them to "use their powers to prevent parking on the pavement where it is a problem and causing an obstruction." So, rather than deal with the problem, those in a position to give leadership basically abdicate the responsibility to local councils who are the last people to want to upset those who want to park everywhere. Still, this current lot do believe in saddling local authorities for everything! Why do people park on the footway and what are the problems it causes? The reasons for parking on the footway are manifold and everyone has their reasons. Aside from people who are naturally lazy, I would list the following as reasons I have heard, read or had relayed to me. This is in no order and not scientific! Well, many families have more than one car and they have to park somewhere. traffic calmed - madness! Image from Google Streetview. Footways are rarely constructed to a "carriageway" standard and constant use by vehicles will lead to a steady deterioration in the condition of the footways. This will mean that further pressure is put on limited road maintenance and indeed road safety budgets. People have choices and freedoms, but this must be accompanied with responsibility and consideration. If you park on the footway to "do traffic a favour" by not blocking others, why is it acceptable to block pedestrians? Perhaps you are parking in the wrong place. You have chosen to have a car, why have you not thought about where you are going to park it? You wouldn't buy a new sofa and expect the tax-payer to build you a room to house it in now would you? If you have footway parking in your street, traffic speed will increase and you will then want traffic calming to deal with the speeding traffic. How can utility companies get at their kit that you have parked over - it will be brought home to you at 3am when sewage is running into your garden, but the water company cannot get at the manhole which needs clearing! "I drive because there is no alternative or the alternative is costly, inconvenient or dangerous." So, while people rely on their car, there will be no alternatives or what is available will be costly, inconvenient or dangerous and they will continue to park their cars where they like as in many cases, there is not enough space to park cars on both sides of the road without using the footway. Activists can lobby the police for enforcement, but it is hard work, it might be better to lobby your council to put in a TRO to stop footway parking. In London or other places with a general ban, ask for a copy of their footway parking design guide or policy and if the situation you are concerned about does not meet the criteria, ask for it to be reviewed. If there is no policy or guide, then how can they objectively design a footway parking scheme? The trouble is, there are some terrible examples of footway parking "improvements" installed by local authorities such as Cann Hall Road, near Stratford. 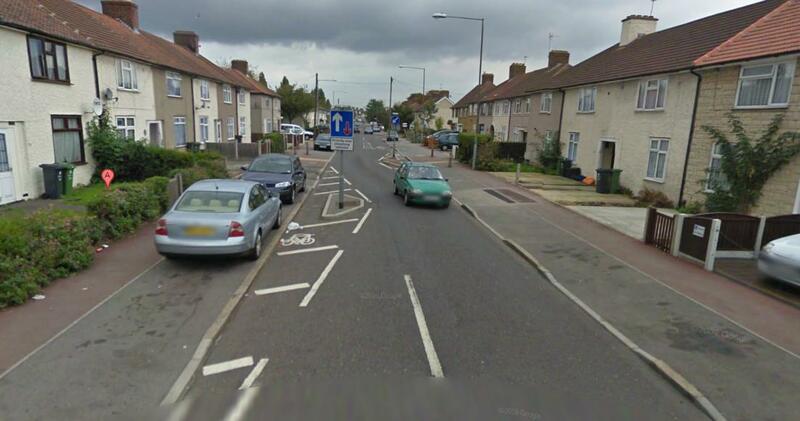 Thiswas the subject of a post by Crap Walking & Cycling in Waltham Forest a while back and Google is not up to date. I cycled this road last year by mistake (I got lost coming back from the City when I was on a training cycle) and yes, it is a mess for pedestrians and cyclists! I fully expect there to be a legal challenge to a council in the near future in terms of the impact footway parking has on disabled people. Councils are transport authorities and they have duties under the Equality Act 2010 to consider how decisions impact on certain groups and in terms of making their transport infrastructure accessible. Sadly, it often takes a case such as this to show how wrong things are before things improve. 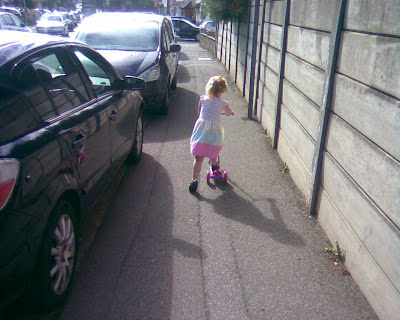 There are no easy answers; footway parking is a symptom of the unrelenting lack of political leadership in the UK when it comes to all aspects of transport. Well, I just got back from the walking school run and yet again, they are bouncing up onto the footway (legally into the marked bays) within a whisker of the kids - we had to move across to let them get up. Another fruitless letter to the council's parking department coming up! *I have referred to "footway" parking as being the legally correct term. It is often referred to pavement parking, but as an engineer, the word "pavement" describes the structural layers of roads. So there! The ideal answer involved a time machine. The Japanese, in a very forward-thinking manoeuvre, decided in the 50s that it would be a mandatory requirement of car ownership that you have to have somewhere off-street to park it near your home. So they have zero on street parking- it just isn't legal. Towns and cities have been designed with this in mind. I say this would require a time machine- sadly we've of course developed our towns and cities with assumed levels of on street parking (which of course are hopelessly naive). Yes, I was vaguely aware of this and presumably, this has something to do with high development densities in Japanese cities - another place for a fact-finding trip! Our policies for parking are mad. We used to have minimum standards, we now have maximum. The problem of course has never been about the number of cars owned, just them all being used at once and people trying to park where they are going to. If we had developed a policy of the vehicle owner having to find a space and not giving unrestricted and free destination parking, I wonder what the UK would look like. Actually, car clubs may be part of the answer as they can be given preferential on-street parking space provision and will be useful for those weekends away to the country or picking up a heavy purchase without having to go out and rent a car or pay to run a car (like me!) for its usefulness. No car clubs near me yet though! There is no logical reason why anyone should be allowed to park 'on the public highway' for free. You or I couldn't decide we didn't wish to own a car and erect a shed in which to store our bikes but I can buy a van, park it on the road for as long as I like and store my bikes in the back. The "right" answer, especially with a Government who believe the "market" is the answer to everything is to restrict the amount of parking to the level that can be accommodated alongside cycle and pedestrian paths, then to implement parking permits and raise the price until the number of cars is reduced. There's no reason you should be allowed to park on 'public' property any cheaper than the cost at which someone could run a private car park nearby. This is how the problem is dealt with in Amsterdam. Unfortunately it needs brave, long term, thinking that our electoral system seems to prevent occurring. We simply do not do long term and where has letting the market decide got us? My local authority has come up with a good wheeze where people living in low car developments who are prevented from obtaining on-street parking permits are being given the opportunity to an overnight parking space in a nearby town centre car park. Now, while these cars will be off street, how is such a policy ever going to deal with the issues? I have the opposite problem. My house has two official parking bays and no car-drivers, but nowhere to securely store a bike to standards required by insurance. This is a new-build house in Cambridge, where you might think the developers would finally have realised the need for it. However while I'm sure some people don't have anywhere else (convenient) to park their cars, I think it's also not uncommon for their own driveway to be too inconvenient. Footway parking is a problem all along my residential street, but most houses have front gardens large enough to accommodate a car, and normally no car in it. Maybe they don't want to back in / out. Clearly there's no need when they can just use public space. But of course I'm the one being anti-social when I take the lane to avoid two car-door zones. There are people all down my street with front garden parking and garages, they just don't use them (although it is a shame that even front gardens are all paved over and I think it is possible to provide parking sympathetically). I have an old planning condition on my place that I need to maintain 2 car parking spaces which I have of course ignored - I have one car space and 4 cycle parking spaces! 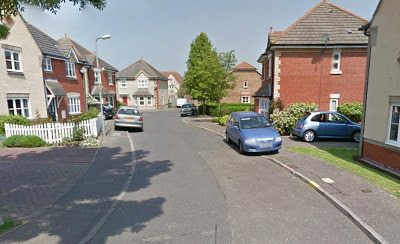 I am arguing with Councils & Police about an estate that was built with own garages & driveways but the home-owners are bone idle so park up the drop kerb & right across the decent cycle path that was put in when estate was built. There's no reason for it as if not wanting to take car into driveway/garage, it can park on road as no yellow lines. From what I've found out is the Police & Councils have ignored complaints about this for near on 20yrs too. So been recording it & making it known its not on! I am reasonably sure that such an offence is for the police to enforce rather than councils as I don't think parking (or driving) on a cycle track has been decriminalised. Start with checking that the track is a track (is it signed?) and if it is, then ask the police to enforce that specific offence. The school and some parents have taken the decision to cone off the school side of the road albeit illegally one day a week. And it has had a great success. We are changing social convention and for that one day at least it is seen as terrible to drive your children to school. I would love it if we could have resident only parking, but that would be expensive. I am in the process of making the road a Play Street and I wondered what your opinions were? I don't know much about play streets, but there is some work being done in London (http://www.londonplay.org.uk/document.php?document_id=1836) I think the idea is that streets are closed for a few hours each week to through traffic to allow kids to play in the street. The wider issue you have is what the local authority has done. On the one hand, footway parking is allowed in most of the UK unless banned specifically. In Alma Road, I assume that it was taking place both sides and the area where the footway was reduced was to stop cars bouncing up on the footway near children which is kind of the problem that my photo shows near my local school (being in London, footway parking is banned unless marked out, which it is here). In my experience, change needs to come from the school community and residents working together. In Alma Road, it looks like there is plenty of resident parking and I would guess parents are causing parking problems, but the problem will be wider. The nearby A56 looks like hell as it is busy, the footways are heavily guard-railed, crossings are away from the school etc. The area as a whole needs looking at to prioritise direct walking (so it is easier and perceptively safer) so parents don't need to drive - a school travel plan helps, but it is a time heavy commitment for the school, but it will work out where the barriers to walking and cycling are. In terms of Alma Road, at the least, the footway needs to be reinstated and parking restrictions put in on the school side for a fair distance up the road. A resident parking is actually possible as a zone now which does not need parking bays, just signs entering the zone and repeater signs every so often. In other words, it would let residents park, but not parents, they would have to park well away (the other side of the A56?) and it might then be just as easy to walk. But, it needs looking a as a whole - funding is difficult, but at least a travel plan would be a focus and can be used for lobbying. Sorry for coming late to the party - I've only just discovered this blog. I've got to say, in both your first example and in the case of Alma Road I'd be tempted to get rid of the footways altogether (make the carriageway flush to the footway thereby creating a change in level, a ramp, for vehicles entering the roads). In theory this would allow vehicles to park closer to the margins and allow more space in the middle for emergency vehicles, etc. Given the overall widths of both roads, I can't imagine speeds would be excessive, especially since neither road is a through route, then making both sites into shared surfaces, with peds and cyclists free to go where they please down the centre could work. Or, if you want radical, do the same thing wrt removing the difference between footway and carriageway, but use Grasscrete (or try to find something that allows for much better coverage with grass) and re-create something done many years ago in Leeds by residents - although they stopped traffic completely and used turf (see 'The Methleys'). Any design would need to incorporate some parking, but it could be arranged to be a way of reducing speed to make it look less road like. A proper job will always cost, but it is a matter of spending priority and political will as usual. Streets look nicer without cars, but yes, if you are going to have them, use them to keep speeds down! It is just an aid. I do not think a driver would want to speed anyway. The street is paved with brick, the road is narrow, full of pedestrians and cyclists, intersections are raised, the police and traffic cameras are everywhere and people give you the same stare as someone who jumps in front of a queue if you speed there. Indeed they would look nicer without cars. I would like to see a policy that is actually followed of removing about one out of every 5 to dedicate to something other than parking cars where parking cars currently exist and where they would not otherwise need to go away, for example building a cycle track, or bulb out to reduce speeds. It could be used for plants and trees, a gathering space, bicycle parking racks, in commercial areas it could be used for seating and sitting down to eat or drink coffee with a friend, decorative lights, wayfinding signs, or it could even be used for just grass.